The very first parade I ever saw at Disneyland was the 1970 Fantasy on Parade. Of course, I was not even a year old yet. But I was there and my family took these photos, so it counts. I love how everyone is standing right in the street. 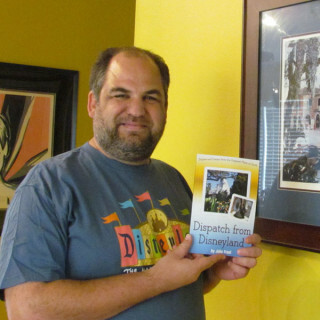 In honor of this week’s premiere of Disney Festival of Fantasy Parade at the Magic Kingdom, St. Patrick’s Day, and, last but not at all least, my mom’s birthday, I’m slicing 50% off the price of the special edition eBook of “Dispatch from Disneyland” through the holiday weekend*. For just $5.00 you can have 29 touching stories and informative essays about the Happiest Place on Earth in a special PDF format which you can read on nearly any mobile device or your laptop or desktop computer. Print it out if you want, but read it digitally and the trees, and I, will thank you. Click here to purchase it right now via Paypal or credit card. 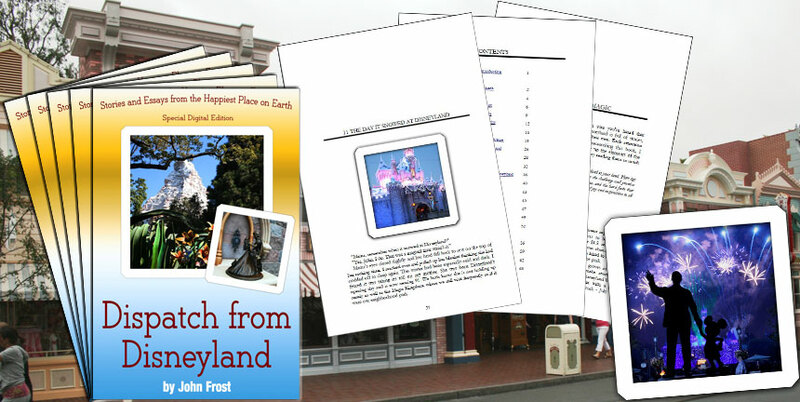 Many thanks to Bryan Pugh at the fantastic DisneylandLive website for posting the very first posted review of “Dispatch from Disneyland.” He definitely caught on to how I intended the book to be a way to quickly escape into that magic you feel at Disneyland, even when you only have a few moments of downtime. Bryan’s website features an amazing collection of Disneyland photographs that he has licensed for non-commercial use (with attribution) via a creative commons license. Definitely go check them out. There was actually a second review this week. My friends at LaughingPlace.com recommended the book to the listeners of their podcast. Like their amazing website, the LPP covers subjects ranging across the wide world of Disney. It features four very knowledgeable hosts and the sort of witty banter that makes the long podcast entertaining throughout. I only wish they did them more often. Finally, guess what arrived! The first printed editions of the book. If you were a Kickstarter supporter, please make sure I have your shipping address (check your email in Mid-Feb for instructions), so I can fulfill your rewards level. If you’re looking for a way to help me spread the news about Dispatch from Disneyland you can feel free to use this Press Release as a starting point. It would be a big help if you would share the news about the book on your blog, social media channels, or on your favorite Disney forums. February 28, 2014 (Anaheim, CA) – Dispatch From Disneyland is a collection of stories, essays, and interesting facts written for fans of any age who love any of Walt Disney’s magical theme parks, but don’t have the good fortune of visiting the park as often as they wish. Inspired by the park that Walt built, Dispatch from Disneyland takes readers on a “you are there” emotional journey to Disneyland via the power of story. Each “dispatch” is meant to bring the reader to a place that reminds them of the magic they feel when at the park themselves. “Dispatch From Disneyland: Stories and Essays From The Happiest Place on Earth” is available in Print, Kindle, and iPad friendly and mobile device special edition eBook. The book’s author, John Frost, owns and writes The Disney Blog (TheDisneyBlog.com), the first blog to cover the entirety of The Walt Disney Company, past and present. John’s grandfather joined Walt Disney’s team of Imagineers in 1954 and helped carve Disneyland out of Southern California Citrus Groves. John’s love for Disneyland sprouted from his family’s yearly road trips from Portland, Oregon to experience Walt’s park. When John thought about writing a book, Disneyland seemed the natural subject. Dispatch from Disneyland is John’s love letter to The Happiest Place on Earth. The collection of short stories, essays, and interesting facts will make you laugh, cry, learn, and most of all wish you were at Disneyland right now. 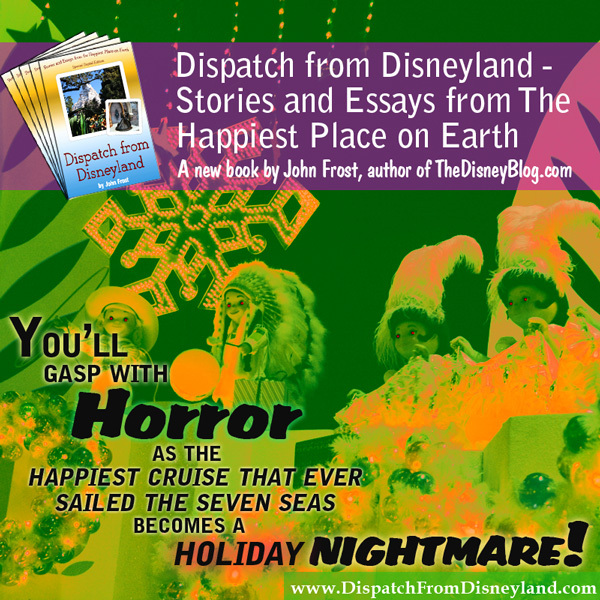 Readers of “Dispatch from Disneyland: Stories and Essays from the Happiest Place on Earth” will enjoy more than 25 beautiful stories and essays about Walt’s original park and one cautionary tale of horror. Only the lucky survive “it’s a small world holiday nightmare”! 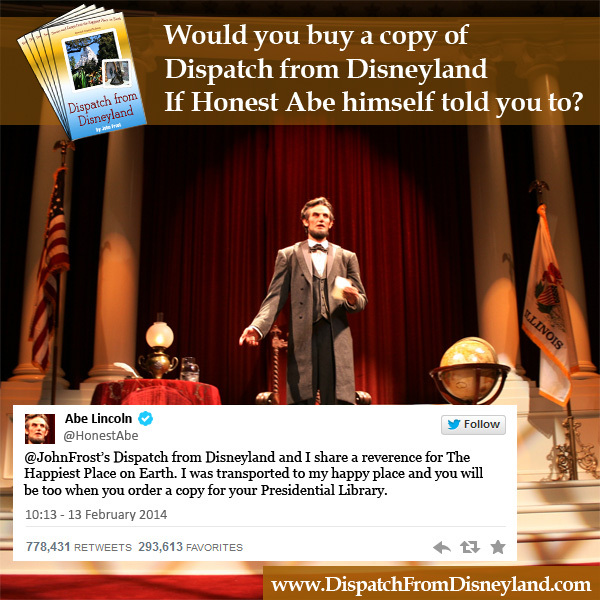 If you’ve been thinking about ordering your copy of “Dispatch from Disneyland,” make today the day. The print and kindle editions are currently climbing the sales charts on Amazon. They soared passed 40,000 last night. If the book makes it into the top 10,000 (or even the top 500 for its categories) then there is a chance for it to take off virally. Do you possess a tablet or mobile device capable of reading PDFs (such as an ipad, iphone, android tablet, laptop, pc, or even a newer generation kindle)? Then you should try the Special Edition eBook version available here. A few extras have been added to this edition. There’s an extra essay and a small collection of color photos. You even save $2 off the price of the print edition. Just think of it as a reward for buying direct. Either way, a purchase today and a review left on Amazon is the best way to help. Thank you. If you can’t trust Abe Lincoln’s twitter account, who can you trust?